a ductless gland lying in the upper mediastinum beneath the sternum; it reaches its maximum development during puberty and continues to play an immunologic role throughout life, even though its function declines with age. During the last stages of fetal life and the early neonatal period, the reticular structure of the thymus entraps immature stem cells arising from the bone marrow and circulating in the blood. The thymus preprocesses these cells, causing them to become sensitized and therefore capable of maturing into a specific differentiated type of lymphocyte. After sensitization by the thymus, the cells reenter the blood and are transported to developing lymphoid tissue, where they seed the cells that eventually become T lymphocytes, a type essential to the development of cell-mediated immunity. If the thymus is removed or becomes nonfunctional during fetal life, the lymphoid tissue fails to become seeded with the sensitized lymphocytes and the body's cell-mediated arm of immunity fails to develop. It is this arm of immunity that is mainly responsible for rejection of organ transplants and resistance to intracellular microbial infection, and perhaps plays a role in natural resistance to cancer. [TA] A primary lymphoid organ, located in the superior and anterior mediastinum and lower part of the neck, that is necessary in early life for the normal development of immunologic function. It reaches its greatest relative weight shortly after birth and its greatest absolute weight at puberty; it then begins to involute, and much of the lymphoid tissue is replaced by fat. The thymus consists of two irregularly shaped parts united by a connective tissue capsule. Each part is partially subdivided by connective tissue septa into lobules, 0.5-2 mm in diameter, which consist of an inner medullary portion, continuous with the medullae of adjacent lobules, and an outer cortical portion. It is supplied by the inferior thyroid and internal thoracic arteries, and its nerves are derived from the vagus and sympathetic nerves. /thy·mus/ (thi´mus) a bilaterally symmetrical lymphoid organ consisting of two pyramidal lobules situated in the anterior superior mediastinum, each lobule consisting of an outer cortex, rich in lymphocytes (thymocytes) and an inner medulla, rich in epithelial cells. The thymus is the site of production of T lymphocytes: precursor cells migrate to the outer cortex, where they proliferate, then move through the inner cortex, where T-cell surface markers are acquired, and finally into the medulla, where they become mature T cells; maturation is controlled by hormones produced by the thymus, including thymopoietin and thymosin. The thymus reaches maximal development at about puberty and then undergoes gradual involution. A small glandular organ that is situated behind the top of the breastbone, consisting mainly of lymphatic tissue and serving as the site of T cell differentiation. The thymus increases gradually in size and activity until puberty, after which it begins to atrophy. a single unpaired lymphoid organ that is located in the mediastinum, extending superiorly into the neck to the lower edge of the thyroid gland and inferiorly as far as the fourth costal cartilage. 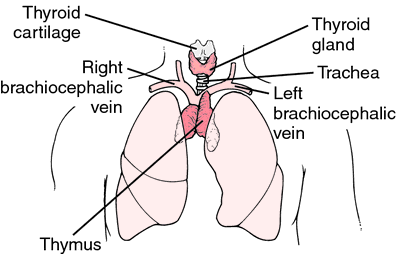 The thymus is the primary central gland of the lymphatic system. The endocrine activity of the thymus is believed to depend on the hormone thymosin, which is composed of biologically active peptides critical to the maturation and the development of the immune system. The T cells of the cell-mediated immune response develop in this gland before migrating to the lymph nodes and spleen. The gland consists of two lateral lobes closely bound by connective tissue, which also encloses the entire organ in a capsule. Superficial to the gland is the sternum. 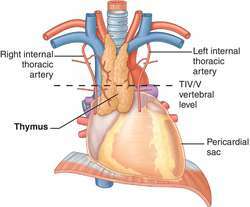 Lying deep to the thymus are the great vessels and the cranial part of the pericardium. The two lobes of the gland differ in size, and in many individuals the right lobe overlaps the left lobe. The thymus is about 5 cm long, 4 cm wide, and 6 mm thick. The lobes are composed of numerous lobules, which are separated by delicate connective tissue. Each lobule is composed of a dense cellular cortex and an inner, less dense medulla. The thymus develops in the embryo from the third branchial pouch and increases in size until attaining a weight of 12 to 14 g before birth. The size of the organ relative to the rest of the body is largest when the individual is about 2 years of age. The thymus usually attains its greatest absolute size at puberty, when it weighs about 35 g. After puberty the organ undergoes involution. With aging the gland may change from pinkish-gray to yellow and in the elderly individual may appear as small islands of thymic tissue covered with fat and surrounded by the yellowish capsule. The normal involution of the thymus may be superseded by rapid accidental involution caused by starvation or by acute disease. Compare spleen. A primary lymphoid organ, located in the superior mediastinum and lower part of the neck, which is necessary in early life for the normal development of immunologic function. It reaches its greatest relative weight shortly after birth and its greatest absolute weight at puberty; it then begins to involute, and much of the lymphoid tissue is replaced by fat. The thymus consists of two irregularly shaped parts united by a connective tissue capsule. Each part is partially subdivided by connective tissue septa into lobules, which consist of an inner medullary portion, continuous with the medullae of adjacent lobules, and an outer cortical portion. The thymus is the primary site for T-lymphocyte differentiation; here, T lymphocytes acquire their range of antigen receptors. During the prenatal period, lymphoid stem cells migrate from the bone marrow to the thymus, filling the cortex of the lobules. Developing thymocytes acquire their characteristic CD surface antigens and their binding receptors. As the thymocytes then move from the cortex into the medulla of the lobules, some are protected but many undergo cell death in a process that culls out those reactive to autoantigens. Less than 5 % of the thymocytes mature into T cells that pass out of the lobules and migrate to the spleen, lymph nodes, and other lymphoid tissue, where they control cell-mediated immune responses. The thymus produces at least four hormones: thymopoietin, thymulin, thymus humoral factor, and the thymosins. At birth, the thymus weighs 10-15 g; by puberty, it weighs about 20 g. After this, the cortical regions of the thymus shrink and become replaced by adipose tissue, although the thymus continues to produce hormones and some thymocytes into old age. Lack of a thymus or thymus hypoplasia is one component of DiGeorge syndrome, which is marked by severe lack of cell-mediated immunity; removal of the thymus of an adult is less catastrophic but leads to a less effective response to new antegens. Thymic hyperplasia results from the growth of lymph follicles containing both B lymphocytes and dendritic cells. It is found in myasthenia gravis and, occasionally, in other autoimmune diseases (e.g., Graves' disease, rheumatoid arthritis, and systemic lupus erythematosus). Thymomas involve only the thymic epithelial cells. Other tumors, including those associated with Hodgkin's disease and lymphomas, involve thymocytes. A lobule isolated from the mass of the thymus gland. It is also called a supernumerary thymus. Thymus persisting into adulthood, sometimes hypertrophying. A small flat organ of the lymphatic system situated immediately behind the breastbone, that is apparent in children but inconspicuous after puberty. The thymus processes primitive LYMPHOCYTES so that they differentiate into the T cells of the immune system. It also differentiates T cells into T1 and T2 classes, a process that is influenced by the early environment of the individual. an endocrine gland situated in the neck region of most vertebrates, but close to the heart in mammals. It produces LYMPHOCYTES which then move to lymph nodes. The thymus produces a hormone called thymosin which causes the lymphocytes to form ANTIBODY-producing plasma cells immediately after birth, but regresses in adult animals. An organ near the base of the neck that produces cells that fight infection. It is at its largest at puberty, then declines in size and function during adult life. A primary lymphoid organ, located in the superior mediastinum and lower part of the neck, which is necessary in early life for the normal development of immunologic function. n a single unpaired gland located in the mediastinum that is the primary central gland of the lymphatic system. The T cells of the cell-mediated immune response develop in this gland before migrating to the lymph nodes and spleen. a primary lymphoid organ lying in the cranial mediastinum or in the neck or throat, (depending on the species), which reaches its maximum development during puberty and continues to play an immunological role throughout life, even though its function declines with age. Called also sweetbread. During the last stages of fetal life and the early neonatal period, the reticular structure of the thymus entraps immature 'stem' cells arising from the bone marrow and circulating in the blood. The thymus preprocesses these cells, causing them to become antigen-specific and therefore capable of maturing into a type of lymphocyte that is essential to the regulation of immune responses generally and the development of cell-mediated immunity. 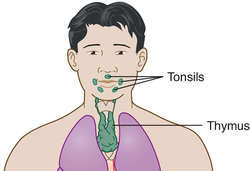 More than 90% of T lymphocytes produced in the thymus are destroyed there in a process sometimes referred to as clonal purging, which is conceptually associated with the removal of self-reactive cells, i.e. only nonself-reactive cells leave the thymus. After development in the thymus, these lymphocytes re-enter the blood and are transported to developing secondary lymphoid tissues, such as lymph nodes and spleen, where they seed the cells that eventually become thymus-dependent or T lymphocytes. If the thymus is removed or becomes nonfunctional during fetal life, the secondary lymphoid tissue and blood fail to become seeded with the T lymphocytes and the body's cell-mediated arm of immunity fails to develop. It is this arm of immunity that is mainly responsible for rejection of organ transplants and resistance to microbial infection, and plays a role in the elimination of cells potentially able to give rise to cancer. leads to failure of the cell-mediated arm of the body's immunity. Primary epithelial neoplasms arising from the thymus are extremely rare in the pediatric population and represent less than 1% of mediastinal masses in this age group. This defect predominantly manifests itself in the form of thymic hypoplasia or aplasia,4 therefore, the total volume of thymus can serve as a key parameter to assess structural deformation. There were no significant histopathological changes observed at doses 40 g/kg and 80 g/kg doses of colchicine in thymus and spleen of mice. After fixation, using a hand lens, lobes of thymus were removed along with the surrounding connective tissue. It is important to know the normal spectrum of radiographic appearance of thymus to avoid misdiagnosis of thymoma or any other thymic lesion. Several studies pointed to possible differences in antibacterial and antioxidant activities among thymus species collected from various geographical regions (27,32). Pathology showed that the cystic mass was attached to the normal thymus. ILCs are found in the intestines and interact with T cells to educate T cells, also via MHCII, as in the thymus. Ct thorax study showed a large non-enhancing intrathoracic fat containing mass lesion (HU ranging from -71 to -102) is seen in the right hemithorax arising from thymus causing displacement of trachea, oesophagus and heart to left side, with mild herniation in to contralateral hemithorax, On administration of intravenous contrast, lesion does not show significant enhancement, no significant mediastinal adenopathy, complete collapse of right middle and lower lobe. Moreover few medullary changes in the form of mild medullary atrophy occurred in the thymus of mice.